The bowyers and users of composite reflex bows know that the highest-quality bows can be made with single-piece horn laminates on the belly of the limbs. During the first period of studies about the development of the bow the researchers thought that the horn of the earliest type of Hungarian cattle had been considered to be suitable for using on the bow’s belly in the 9-11th centuries. 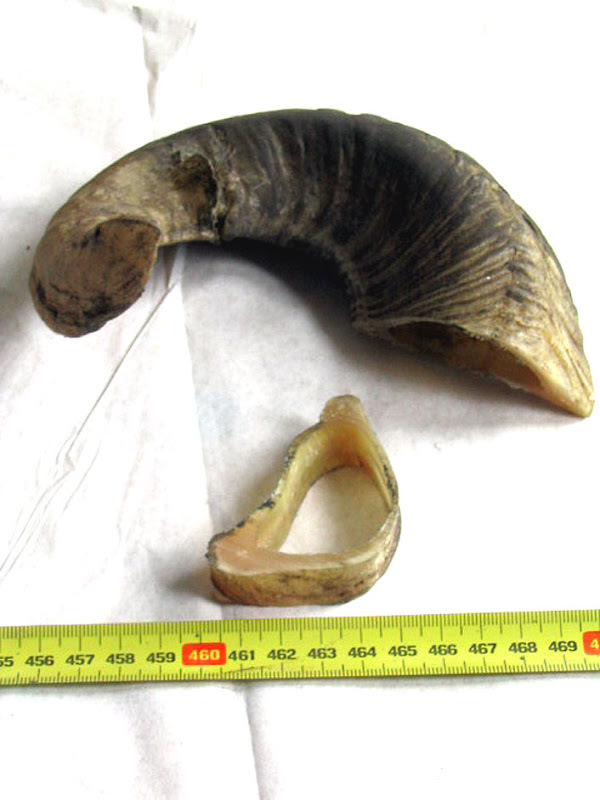 The reason was the extreme length of that type of horn (Picture 1). 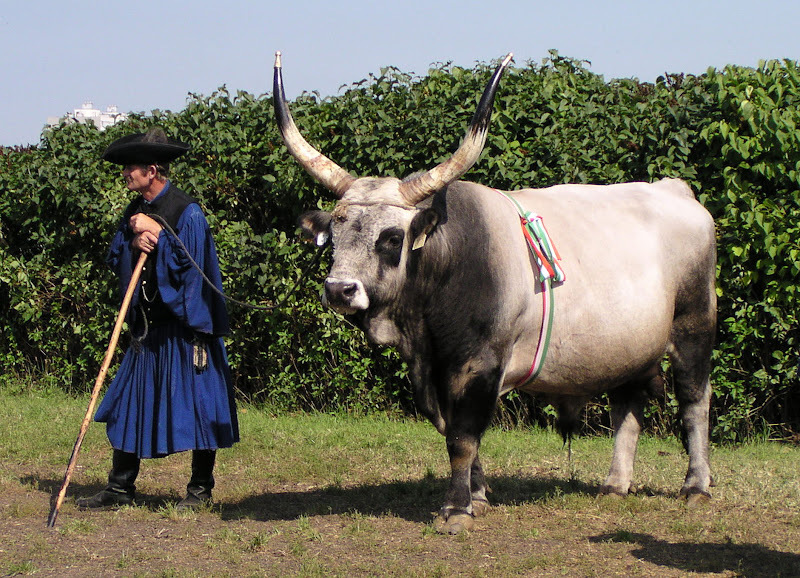 In the 1960s archaeo-zoological researches showed that there were not any Hungarian finds from the 9-11th centuries that referred to long-horn cattle. The question whether or not long-horn cattle did exist in the 9-11th century gave birth to another question: What kind of horn was used for making Hungarian bows. “The usage of sheep-horn has not been planned and intended. It was because I did not manage to purchase the horn of grey cattle for making my first bow. Instead, I could get the horn of merino sheep, as an occurrence of coincidence (picture 4). The shape of the horn of merino helical and it’s narrowing towards its tip. Its cross-section is almost a triangle. Its length can reach 70-80 cm. The thickness of horn is 1-1,5 cm measured from outer contours (picture 5), which provides sufficient material for making a bow. That thick plate is very advantageous. Despite its helicoidal structure, it does not twist around its own axis; it would not twist the limbs of the bow, even after a long time. Preparing sheep-horn and removing the unneeded layer is a time-consuming manual work. Since the horns of different rams are not equal, I always prefer using the horns of the same animal for a given bow. 1/ I warm up horn plates in boiling water and straighten them. They are curved towards the edges along their length. If the horn plates are wide enough, their arcs adjacent to the edges can be sawn off. 2/ If the width of the horn laminate measures only 25 mm, I prepare a cavity on the wooden core with some wooden edge at both sides along the limb and then the narrower horn laminate is glued in to this “frame”. This method worked well with the bow that was backed with birch bark, called as “nyírkérges” in this text. 3/ Finally, I file the limb to a convex profile and polish it. Sheep-horn is thicker and more massive than cattle-horn, so it is better. Moreover sheep-horn usually does not crack or its layers do not separate from each other (picture 2 and 3). Bows made of sheep-horn laminates are stronger than the bows made of horn-cattle laminates, even if their thicknesses are the same. It is likely that the thickness of tendon-wood-horn structure is significant in terms of the strength (as expressed by “K”, which will be explained later in the text). 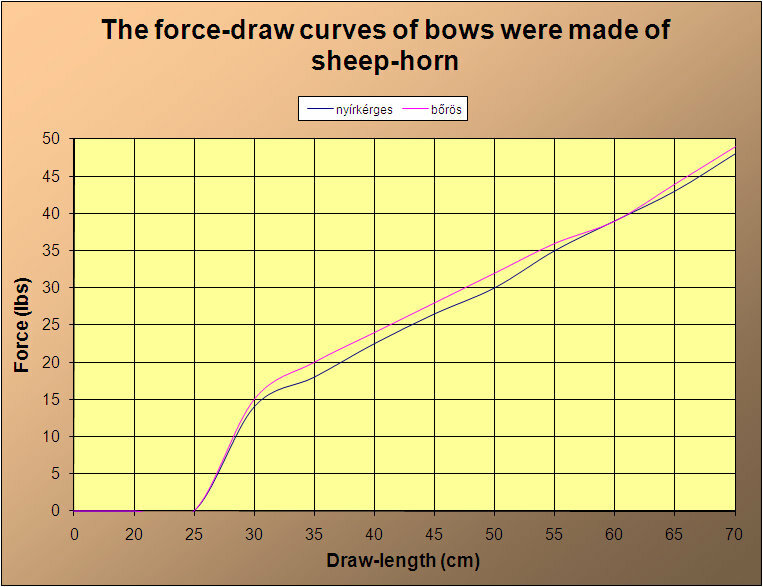 I am sure that all parameters being equal, a bow made of sheep-horn would perform better because its makes a smaller diameter cross-section that ends up with lower total mass of limbs. 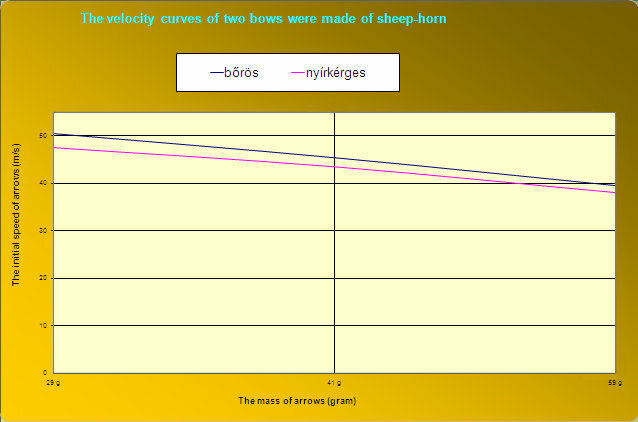 We harvested data of the mechanical properties of two bows made of sheep-horn. 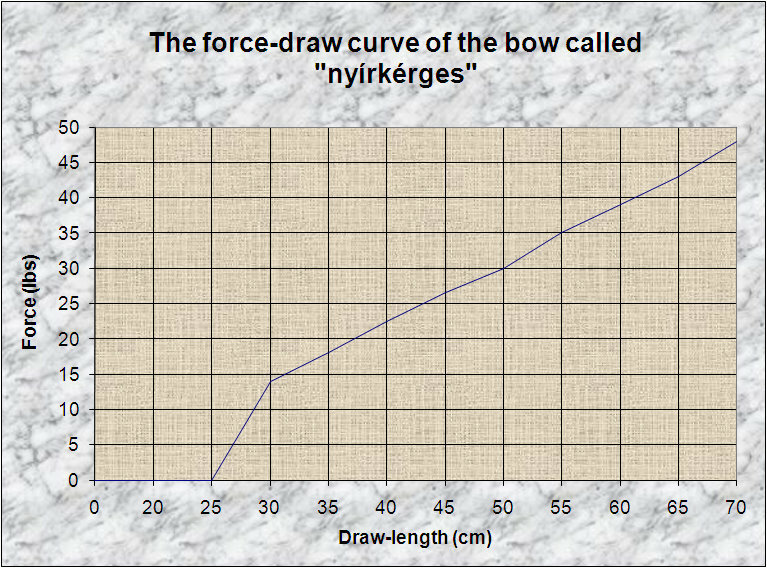 We called those bows “bőrös” and “nyírkérges” (Table 1 Graph 2, 3; and Table 2 Graph 4). There was only one bow made of cattle-horn available to compare with our test samples. 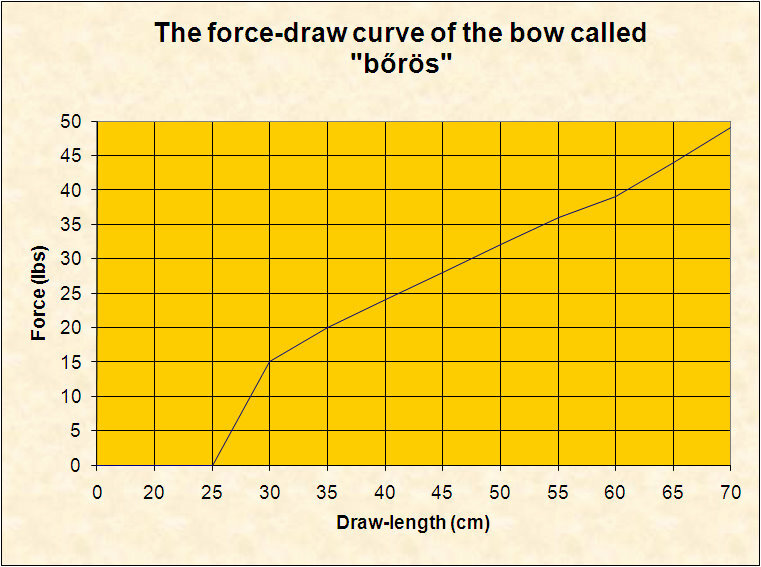 We compared our data with the data of Prof. Dr. Gyula FÁBIÁN’s bow. 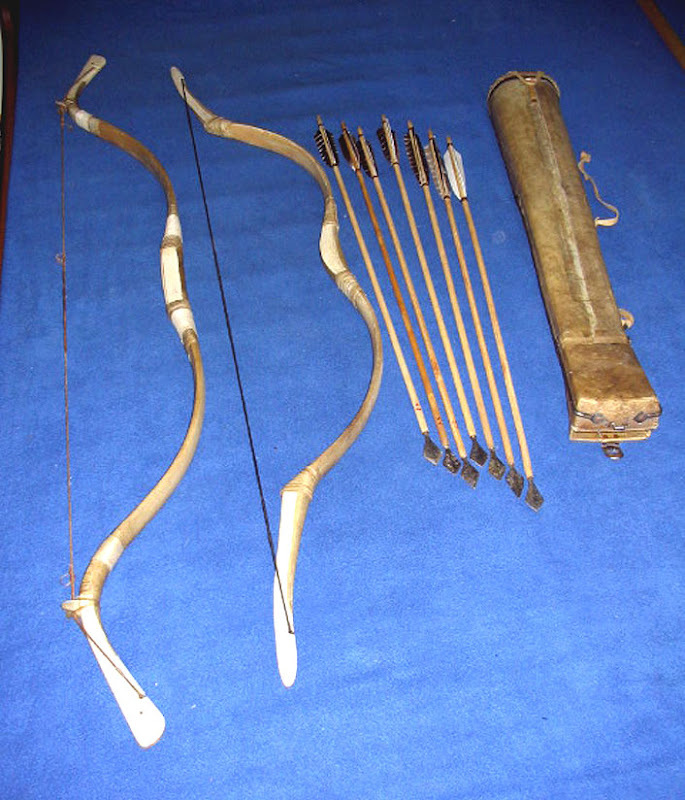 He had used cattle-horn on the belly of his bow in 1970s (This very early reconstruction of Hungarian bow can be seen at the Museum of Agriculture in Budapest). 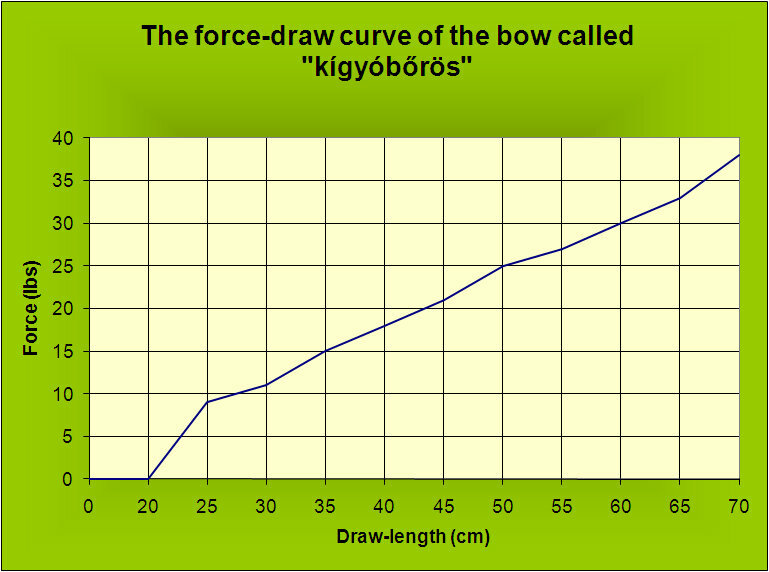 His bow is labelled as “Kígyóbőrös” in the tables and graphs (Graph 5). The draw weight of our bows was almost similar. “Bőrös” weighed 49 lbs. while “Nyírkérges” was of 48 lbs. of draw weight. “Kígyóbőrös”, however, was 10 lbs lighter and drew 38 lbs. (table 1 graph 6). The most objective evaluation is shown by the virtual mass of bow (Klopsteg’s “K” value) because “K” is not in strong connection with the draw weight of a bow. 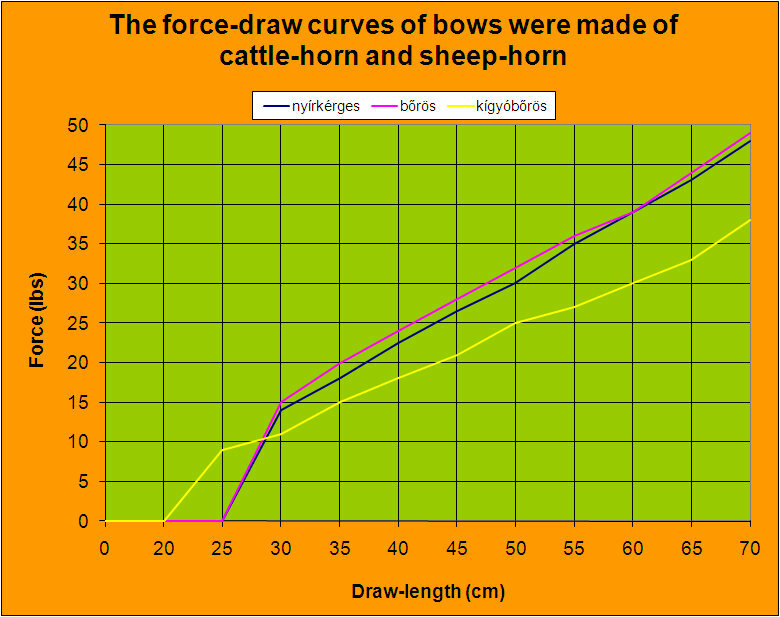 All these numeric data showed that our bows are more efficient than the bow made of cattle-horn, despite the fact that our bows are stronger. According to our opinion greater strength was generated by more amount of material. We should keep in mind that the thickness of the bone plate on Fábián’s bow was a bit thicker than that of our bows. Furthermore Fábián’s bone plate was not made of antler but of rib (from horse) that increased the inertia of horn and damages the value of “K”. If we compare results, we can say that sheep-horn is suitable for making a bow as much as cattle-horn. 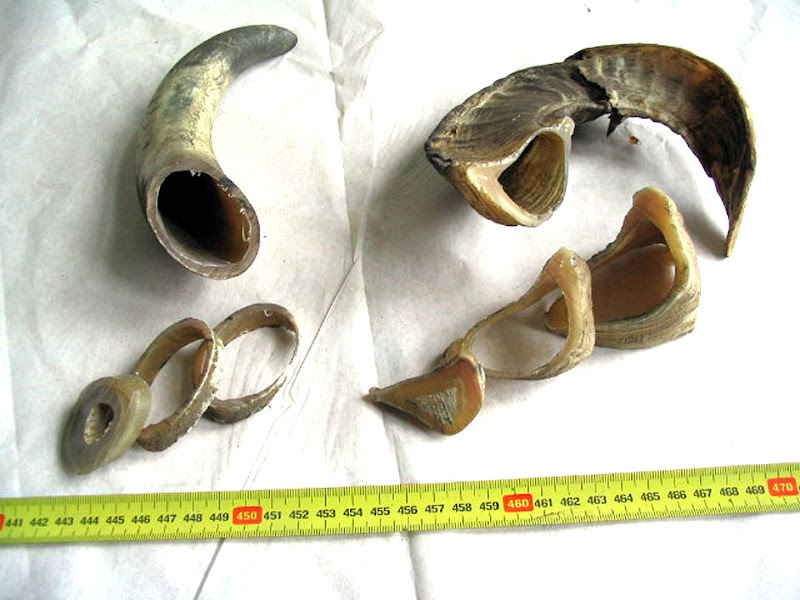 Sheep-horn does not cause fatal problems during the process and its mechanical efficiency is not inferior than the efficiency of cattle-horn. Consequently we can consider sheep-horn as a material which may have been used in the period of the Great Migrations between 4th and 12th centuries. Nowadays, Merino sheep is the only available species in Hungary. It would be an interesting attempt to speculate the varieties of sheep species of which horns were used in making hornbows a thousand years ago. 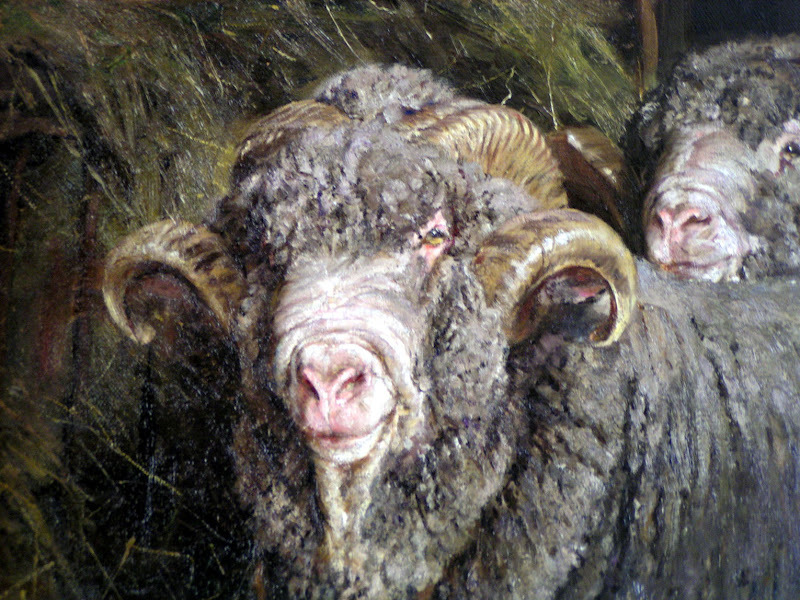 In Hungary Merino sheep expanded in the 18th century and became the prominent species in the 19th century. So this variety or similar type could not have existed in the 10th century (Picture 5). 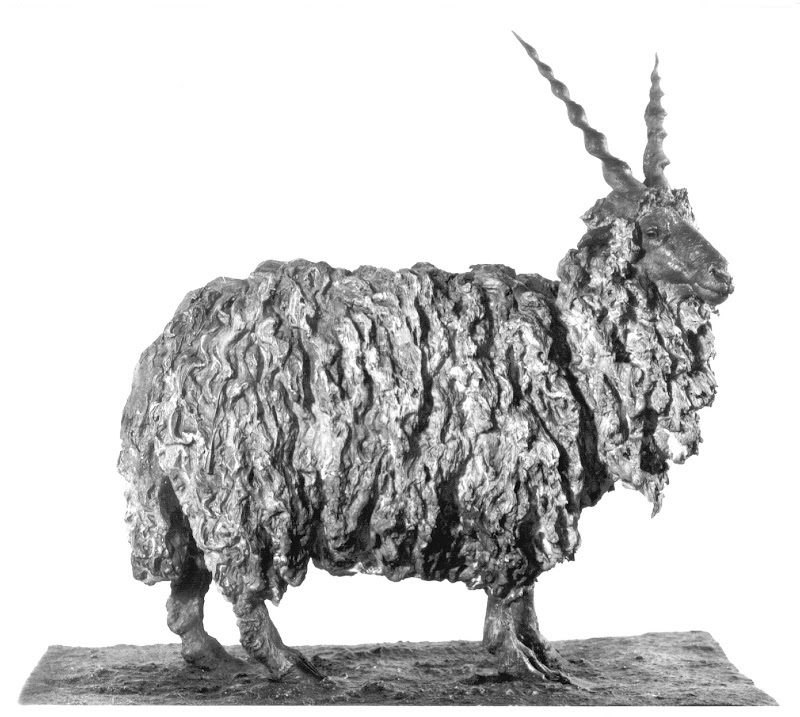 According to public opinion the Hungarian conquerors’ sheep could be similar to “Racka of Hortobágy”, a breed that still exists. However, this idea is not acceptable. Animals with twisted horns appeared in after 13th century and its spreading is believed to have happened in 14th century. From a realistic point of view, there are only two of existing, selectively-bred sheep-species in the Carpathian basin. They should be the most similar ones to the Hungarian conquerors’ sheep. These are “Racka of Transylvania” and “Racka of Gyimes” (Picture 7). Their horns are similar to the horn of Merino but curved a bit wider than does the horn of Merino sheep. In terms of the bow making process it is similar to Merino horn. It is questionable however, whether the quality, stiffness and elasticity of the horn of existing species are comparable with that of the species in 10th century. Unfortunately we have no data to determine it. In our opinion the quality of horn depends on nutrition as much as on the genetic properties of the sheep. 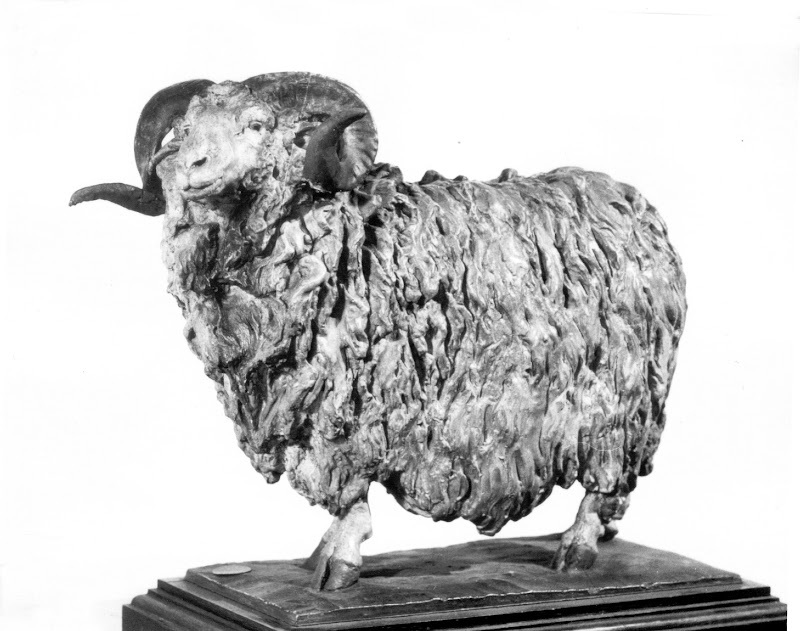 We would speculate that the horn quality of a naturally-fed merino ram may become similar to its ancestors 1100 years ago. The bows were made by Gábor SZOMBATHY. One of them is a later Avar type and the other one is an early Hungarian type.